I long ago learned the famous three hour KM sweater was not going to exist for me, I may now be on my way to my first 300 hour MK scarf. 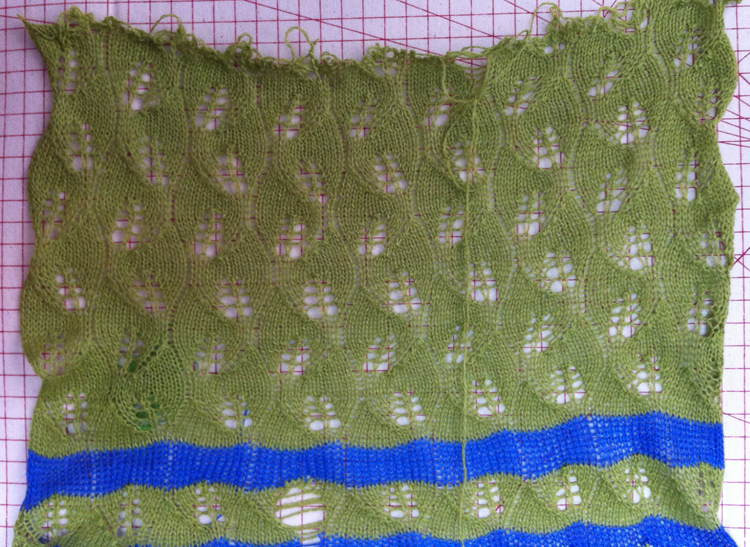 Dropped stitches continued in spite of my visually checking each row after transfers. 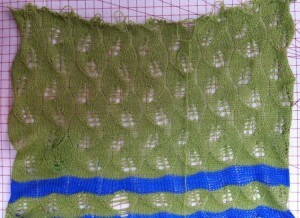 At one point it took well over an hour to try to get back to a row where I could manage a “repair”. When I got a dropped mess in the same spot again I went the route of intentionally taking the knit off the machine, here is the baby (I have to admit I am beginning not to love these leaves so much any more!). Follow up: decades ago for a while I decided to make children’s knits. The presumption in part was that they might take less time than adult sweaters but between scaling back motifs, and having a penchant for complicated, I soon found production was not practical in terms of financial returns. 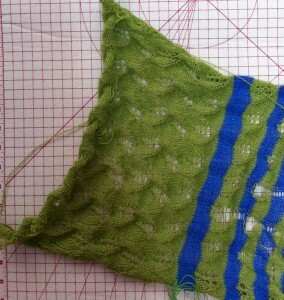 I remember at one point a green sweater I made that caused me so much grief I swore off using that color ever again. All knitters experience dropitis: the bliss of having the knitting magically falling off the machine = great fun at row 900+ of DBJ or double bed tuck long scarves and shawls! In the instance of this piece I have found it actually takes less time to ravel back to knit rows off KM and rehang than to try to correct dropped stitches on the machine. The yarn continues to split, and is being a nuisance. Then there are moments intended to keep one humble: after a huge hole cropped up, taking the knit off, rehanging it, knitting 5 more rows of repeats I noticed I had accidentally at some point close to the start of that adventure accidentally pushed into work one of the needles that had been out of work creating the ladder in that location, and off it all had to come again. 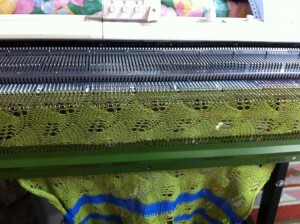 Whether beginners or experienced, knitters absolutely get the opportunity to play Penelope in knits from time to time. This apple green may be the new color I will avoid for a very long time.